We found the best thing for parents who finally decide to take the plunge and.... have an evening without the baby! preferences and nightie night song. You hand your A Parent's Journal for the Babysitter (i.e., miracle journal) to your babysitter and smile and then continue to run out out of the house before it's too late! Whether it's for a parent watching your child, your best friend or your favorite nanny, this journal is sure to bring relief to all. Because there are tabbed preprinted sections for such things as favorite activities, food ideas, sleep routine, and special phone numbers, nothing is left out. Parents fill out the journal once and then a note pad is provided for the parent to fill out for the current babysitting day from things such as where the parent will be to activity suggestions. 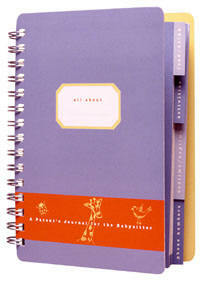 We love A Parent's Journal for the Babysitter - this one's a keeper! Check out www.Loralindesign.com for fine neighborhood stationery stores near you!